American River College is home to approximately 30,000 students, over 13 percent of those students may be suffering from a lack of food. However, faculty at ARC are hoping to help these hungry students by providing easier access to the foods they need. The Nosh Nook on the third floor of Davies Hall was co-founded by Kristina Casper-Denman, and Susannah Martin, both professors in the Behavioral and Social Science Department. Shoved into the far wall of the Behavior and Social Science Department’s faculty workroom are shelves, weighed down with boxes and bags of processed food. Large containers of granola bars are squeezed next to stacks of canned tomatoes. There are two large Tupperware tubs filled with pasta and lentils. This is where the Nosh Nook has resided for the past year and a half. When did it open? When did they come up with the idea? “We have more students than Sac State, we have needier students in many cases then Sac State. The least we can do as a community college is to make sure that everyone is taken care of,” Casper-Denman said. According to a study conducted by the Urban Institute, a research institution from Washington, D.C.,13.3 percent of community college students suffered from hunger insecurity in 2015 Social researchers define food insecurity as the inability to access or afford adequate food. Although this is a marked improvement from the 21.2 percent of food insecure students shown between 2008 and 2014, it is still higher than the 11.2 percent of students facing the same problem who attend a four-year college. Casper-Denman said that after discussing the issue with fellow faculty there appeared to be a real issue present. From there Casper-Denman said the students would be better equipped to get jobs to help support their families. The organizers of the Nosh Nook try to provide five basic staple foods that transcend cultural differences. It is the hope that those utilizing the Nosh Nook will be able to use the money they saved to buy fresh food or other essentials to healthy living. . There are multiple avenues a student-or member of the campus-who would like to partake in the food pantry’s offerings, may take. If they are taking a class from a Behavioral Health and Social Science Professor then they come down during their professors office hours if they wish or make appointments. There is even the option to have the professor bring the food to the classroom. The more common avenue however, is to find the Behavioral Science office on the third floor of Davies Hall. Where the student must state their purpose to the clerk, who will then walk them to the office of a scheduled professor who is available to attend the Nosh Nook at that time. “If the students want the food they come in here and then we direct them to the professor,” said Brad Lavin, a Student Aid and clerk for the Behavioral Science Offices. The professor then leads the student to the Behavioral Health and Social Sciences kitchen. From there the professor will help the student pick out the food they wish to take. They then registers the transaction in a notebook. The desired food is then puts in in a baggy for the student to take home. There is no limit to the amount of food a student can get from the food pantry, it is based on the student’s needs. The third floor of Davies Hall is not the only place trying to provide food to students. “There is also one in the Center of Leadership and Development that they are starting right now,” said Lavin, who is a member of Phi Theta Kappa Honor Society, which is the international honor society of two-year colleges. Student hunger on campus has been the subject of many of PTK meetings as of late. 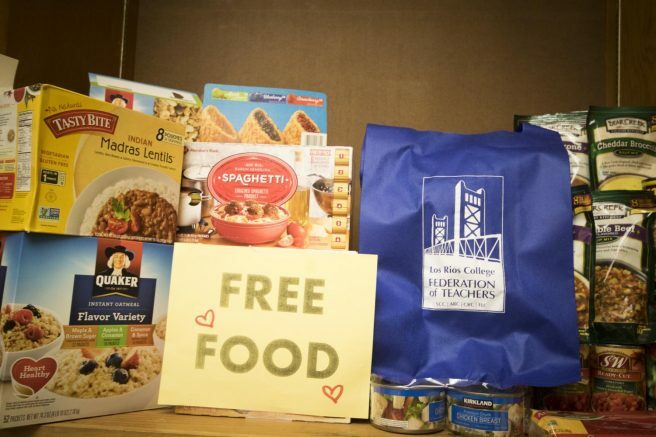 “We are trying to get together the PTK chapters and we are trying to help the [Campus Life Enrichment Committee] start their food pantry,” Lavin said. One of the ways they are thinking about doing so is by creating a point system that will track students who use school resources. Each student would begin with a designated amount of points, enough to provide them with two meals a week. Are we prepared for a school emergency? 1 Comment on "Department opens up food pantry for hungry students"